Mount Washington and the surrounding Presidential Range have some of the world's worst weather. This makes the Presidential Range an ideal alpine training ground. Whether you're learning to winter camp, practicing ice ax self arrest, glacier travel, or training for a trip to Denali or Rainier, the Presidential Range is a good place to hone your skills. Please contact us if you'd like to set up a traverse or other northern NH trips during dates that aren't listed on our schedule. We're usually pretty flexible about most non-holiday dates. 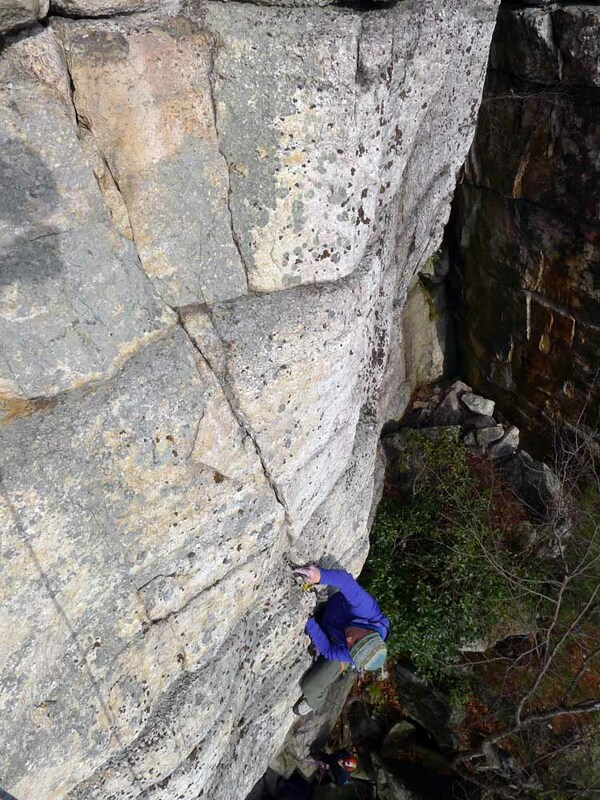 I was out rock climbing yesterday and Thanksgiving day, just trying to get some last licks in. It seems like cold weather is just around the corner. Yes, there will be more warm days, but they're fewer and further between this time of year. Lost City was wonderfully quiet and we were able to climb by ourselves all day long. Climbing with an odd number of people is fun because I'm able to get up above and take pictures, something I really enjoy doing but don't do enough of most of the time. Here are some images of Doug Ferguson, owner of Mountain Skills Climbing Guides, leading one of the many beautiful lines there. 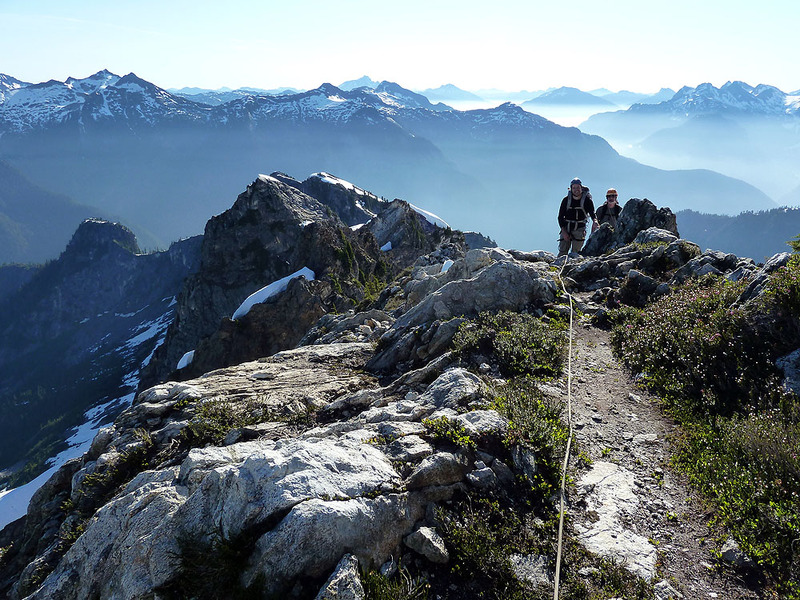 The North Cascades are unlike any other mountain region in the lower 48 United States. The climbing there involves bushwhacking, glacier travel and rock climbing to reach the craggy 8000-foot summits. The region is rugged, and feels remote despite it's proximity to large cities like Seattle and Vancouver only a short drive away. 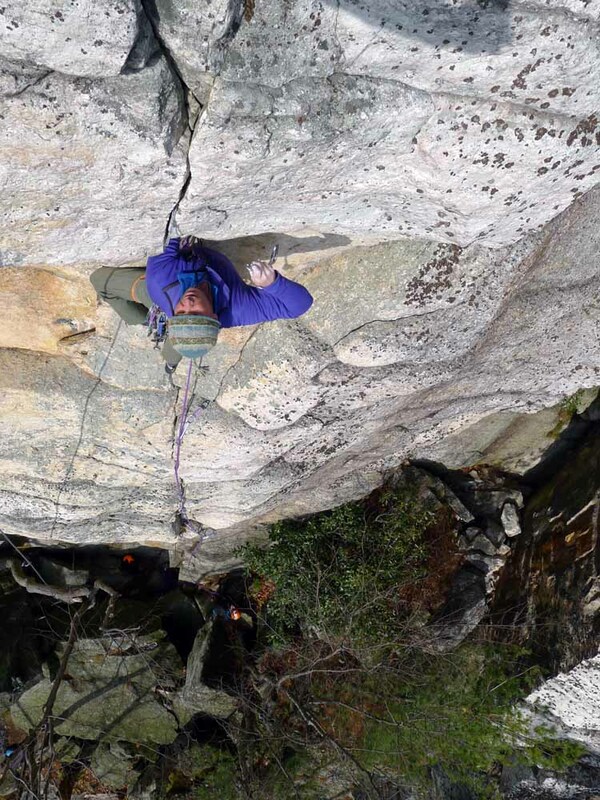 Climbers of all abilities will enjoy summer alpine climbing in the North Cascades, but the climbing is best suited to those that have some mountain experience. The average trip length for a summer North Cascades outing is 6-9 days. Contact us for more information or to set up your private trips. Rates vary based on the objective and the length of your stay. Late last season I purchased a pair of Black Diamond Fusion ice tools. I had the chance to use them for about a month before the season ended. This was just enough time to get comfortable using them. I used them again yesterday, with the Fusion picks, while climbing the Black Dike. It's the first time I've used these tools for traditional mixed climbing that has more of an alpine feel. I can honestly say, after using the Fusions yesterday, that they were the best tool I could have brought along. The fatter Fusion picks still look pretty good; Cannon mixed routes have a tendency to destroy picks. Even more importantly, the tools are stiff, which makes them very responsive to feedback. 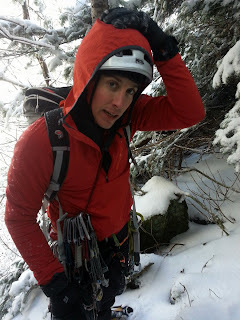 Feeling around on snow-covered rock for hook placements demands a responsive tool. The hammer is another nice addition. I was able to pound a tool into deeper, pick-width cracks, using the head of the other tool. The solid steel head is good for pounding, and doesn't deform at all when it gets pounded on. I used to pound in my Nomics too, and this worked fine, but the head had a tendency to get very dinged up. Here's my original review from last season. I'm looking forward to using the tool more this season. 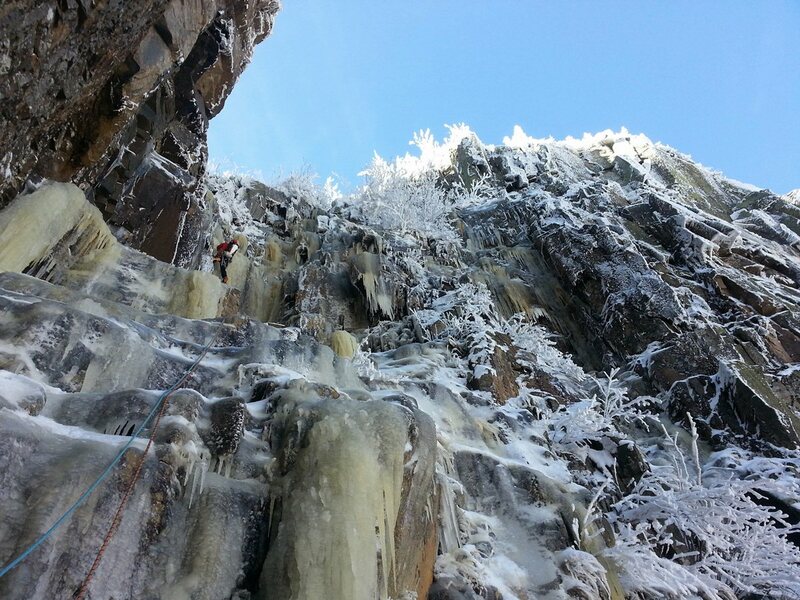 Early season ice ascents are always interesting. Approaches, lightly dusted with snow, feel sketchy. The ice usually doesn't protect well. Hands go numb easily and the movement feels very blocky and awkward. Turf isn't frozen yet and mixed climbing feels scary. 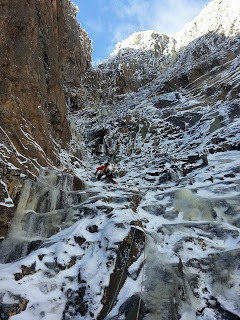 It's a good reminder that ice climbing is a challenging pastime, and that upward progress over moderately difficult or difficult terrain is hard fought and feels scary. 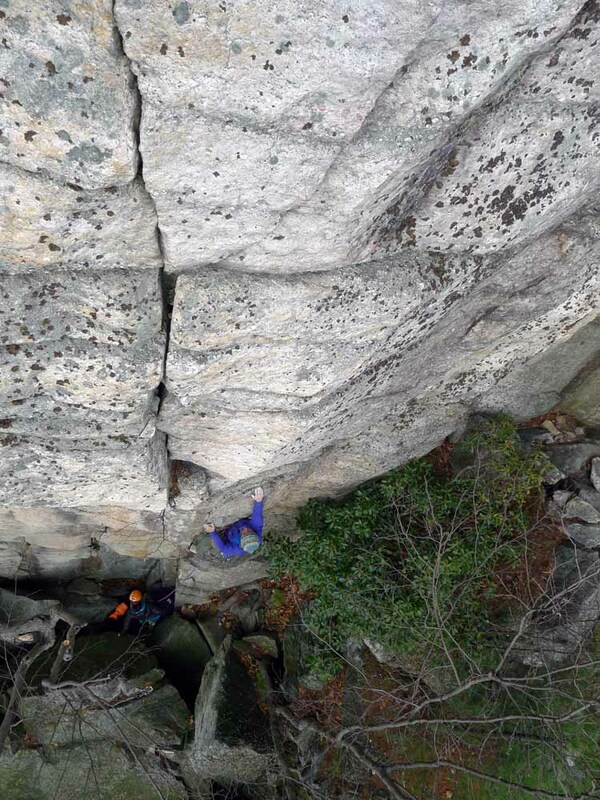 Erik Eisele, one of my favorite climbing partners, and I climbed the Black Dike on Cannon Cliff yesterday under beautiful blue, sunny skies. 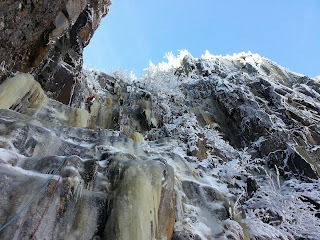 Every year I say "this year I'm going to wait for real ice to form" yet nearly every year I do manage to sneak in a few early season winter climbing days. So much for waiting for winter to arrive. By modern standards the Black Dike is an easy climb. However, nearly every season now it's my first climb of the winter and it always feels demanding. Ambling flows and balancey climbing up delaminated, unprotectable ice on pitch 1 leads to the fixed belay below the crux. 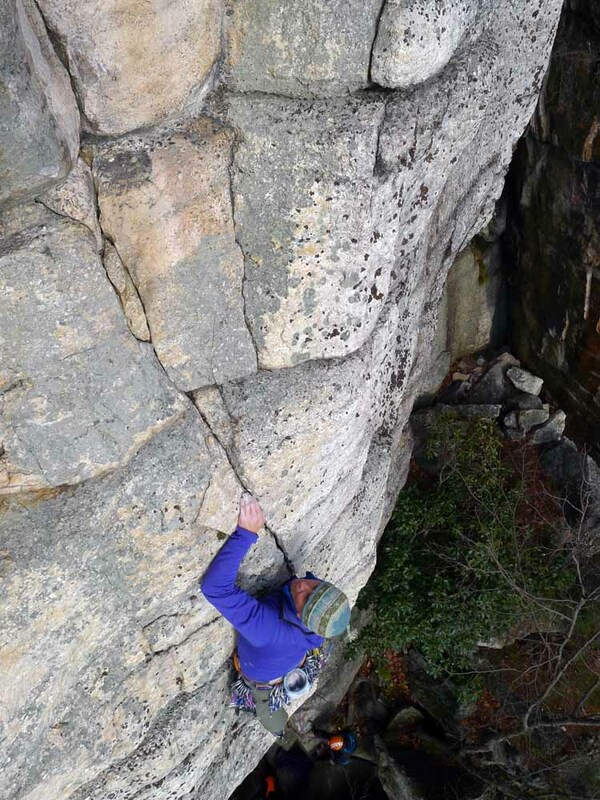 Leading the crux in early season conditions always gives me pause. Knocking the rust off takes a little while. I stand at a safe stance before I commit to the crux. Is this doable? Is it safe? Am I going to climb into a place where there's no gear only to get stuck? I'm left with more questions than answers, and this leads to intimidation. After a few moments I find some tool placements that hold my weight, stomp out a few footholds and move up. Eventually I find decent gear, and the confidence to proceed. The process repeats itself as I work my way up the ice-free chimney. I search for hooks and use one tool to pound the other tool in at each stance. I reach the ice as I run out of rock protection. Erik packed a single rack, which is more than adequate. I would have brought more gear though. As I've aged my tolerance for risk has decreased and I like having more gear. It doesn't matter now though, there are good sticks in pretty yellow ice just above me. I let out a rebel yell and run up to the the fixed anchor 15 feet above. 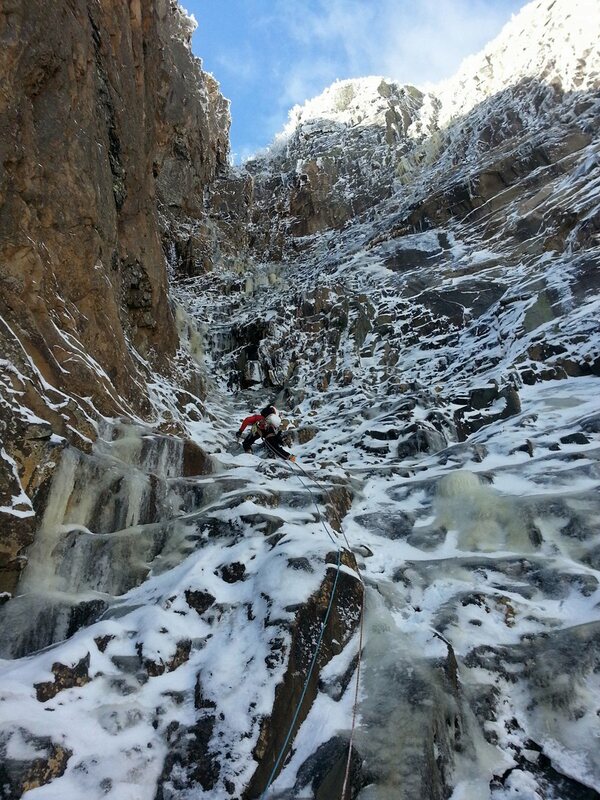 Pitch 3 has a bit of challenging ice climbing, but if you've made it through pitch 2 this time of year, you're going to get to the top of the Dike. There was even enough ice for 4-5 screw placements. Erik marched up vertical flows and corners into the beautiful snow covered trees at the top. Fifteen minutes later we were walking down in the warmth of the mid-day sun. Now we can both go back to rock climbing for another month, as real ice begins to form in earnest. Let's hope for a better ice season than the last one. This is a climbing blog. I'll be departing from the normal topics here because I feel this is important. The Hurricane Sandy warnings were pretty much just hype in my neck of the woods. We've had at least a dozen other days this fall where we received more rain than we did on Monday. So, hearing from my family about the utter devastation that has occurred along the coast is heartbreaking. It's safe to say that the Jersey Shore many of us knew as children, growing up there, won't be the same again for some time to come. Some of my relatives don't have electricity yet. Gasoline is hard to find. School is cancelled and many people aren't able to go back to work just yet. My parents residence was spared, but just blocks away people's houses were torn apart. These people have nothing left and have to rebuild their lives and their homes. Most friends and family I've checked in with are fine. Many of them have been happy to here from me though and are glad for any contact or well-wishes we can offer. If you have friends in the NJ/NYC area and you haven't let them know you're thinking of them, why not do so right now? Most likely they don't need your help but they'll be glad to hear that you're thinking of them.